Nisbet churchyard. 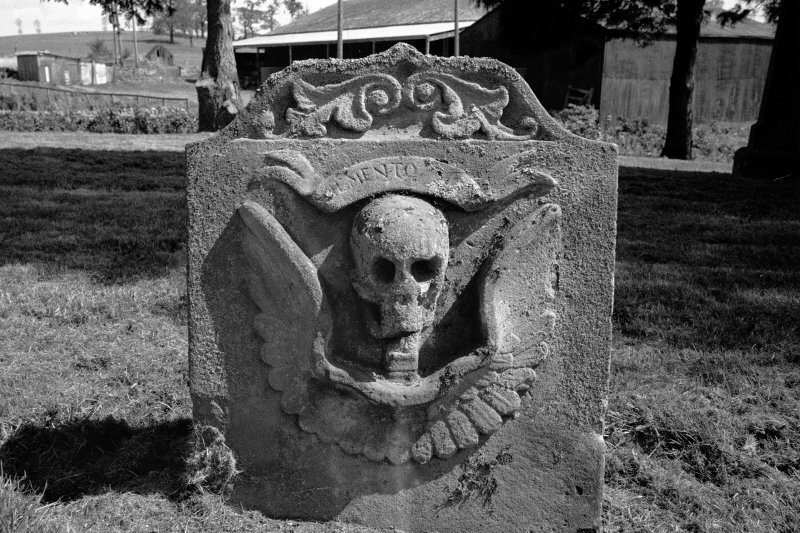 Gravestone commemorating Thomas Rutherford d.1743. Rear view showing winged skull. 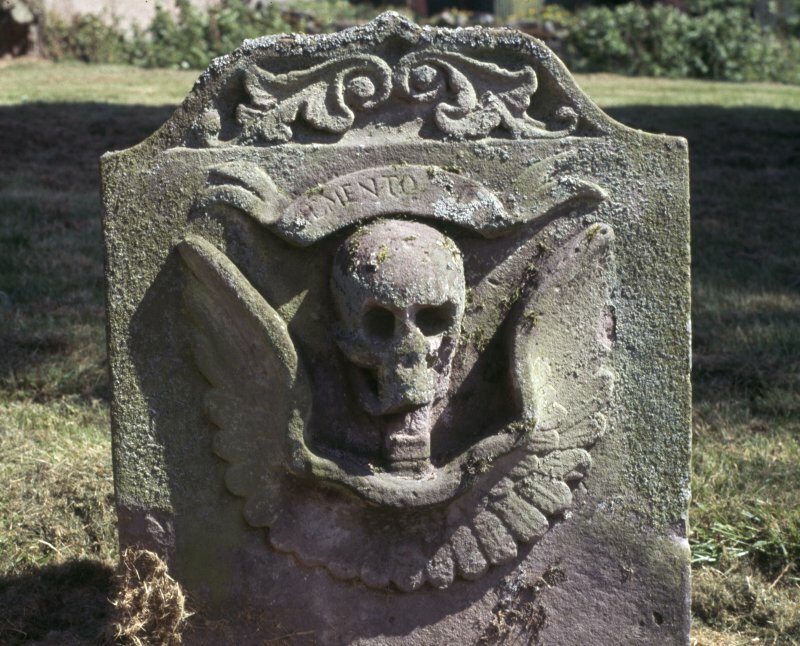 View of headstone to Thomas Rutherford d. 1743, Nisbet Old Church burial ground. (NT 6732 2572) Church (NR) (Site of). Nisbet Church and Churchyard. The parish church of Nisbet was granted to Jedburgh Abbey in the second quarter of the 12th century; but it became superfluous in 1612, when the parishes of Crailing and Nisbet were united and Crailing Church was appointed to serve both (Acts Parl Scot). It was demolished about 1757, (Statistical Account [OSA] 1792) and by 1792 not a vestige of it remained. At the E side of the churchyard, which is near the railway-station, an entire hog-backed stone rests upon two unrelated fragments of others. It measures 5ft 5in in length and tapers in width from 1ft 6in to 1ft 1 1/2in, while the thickness is about 11in. Each of its sides shows three rows of shingle ornament. Of the two supports, one seems to be plain while the other one bears a chevron decoration. The only other stone falling within the period before 1707 is a small headstone commemorating THOMAS RUSELS, who died in 1670, and MARGARET RUSELS, the date of whose death is illegible. Some other names, probably of children, follow, but are covered with earth ; one may be MARGARET. A gable finial-cross, (W Laidlaw 1905) stands close to the hog-backed stone. It measures 1ft 3in in height by 1ft in breadth by 3 1/2in in thickness. RCAHMS 1956, visited 21 March 1933, 24 October 1944. NT 6733 2572. No trace of this church remains but at its site a rectangular depression in the turf, measuring c 13.5m EW by c 8.5m transversely and c 0.3m deep, may represent the outline of the formed church. 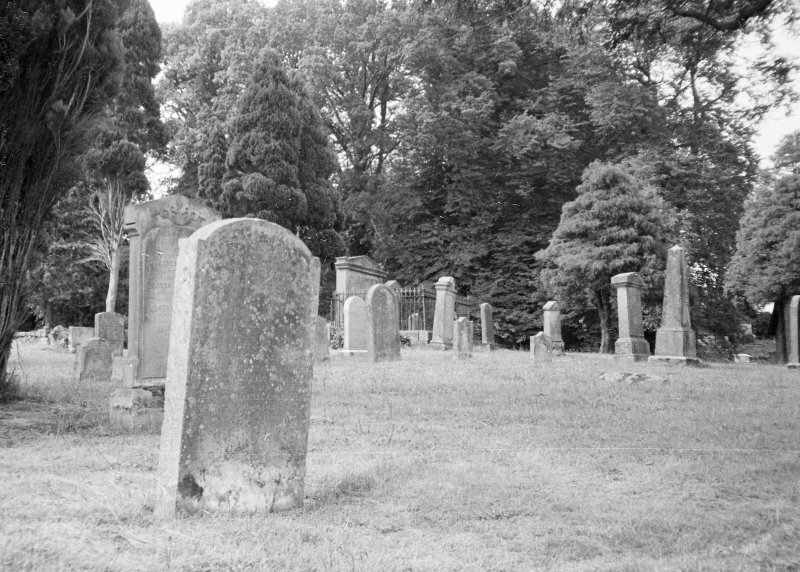 The headstone commemorating Thomas Rusels was seen in the churchyard but the hog-backed stone and gable finial cross were not located (RCAHMS 1956). The hog-backed stone stood on top of a slope on the east side of the churchyard. (Information from Mr Young, blacksmith, Nisbet). Visited by OS(WDJ) 25 November 1963. The hog-backed stone was broken into several bits and buried in 1963 by the graveyard attendants to facilitate motor-mowing. It has since been restored by the Hawick Archaeological Society and is to kept in Hawick Museum. Information in letter from George Wood to OS 15 December 1964; J T Lang 1975.